Timor Leste footy may rise again – All it needs is…YOU! Inor da Silva just loves Australian Rules football. A member of the Timor Leste Crocs International Cup team in 2011, Inor still lives the game as much as he can. His social media pages are littered with photos of the glory days of the Crocs playing against international teams. He is proud to fly the flag and holds the hope that one day Timor Leste footy can come back. 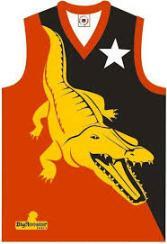 Back in 2008 World Footy News wrote a story, Timor-Leste Crocs enter Asian Footy, looking at the start of the Timor Leste Crocs and the development of the game in the nation. Back then it was full steam ahead, but after their IC11 involvement the Aussie Rules footy scene has dropped away. One particular paragraph in that story paints the picture of how the game started in Timor Leste, as well as introducing two of the key people in establishing the game, Luke Gosling and Justin Bayard. “Australian peacekeepers and aid workers have been heavily involved in helping get the country on track, with the island located just 640 kms north-west of Darwin. Two such Australians were Luke Gosling and Justin Bayard, who started the Timor-Leste Australian Rules Football Club in 2008. As Gosling tells us, "The forerunner was the East Dili Eels, a group of blokes who would kick the footy on a Thursday afternoon. So we have 2 teams, the National team known as the Crocs, and the Eels who form for training games". Luke Gosling is now the Labor party representative for the seat of Solomon in Darwin. He does not have a role now with the Timor Leste football scene, but still has astute observations. And in part that is the objective of this story. The Timor Leste players are still turning up to train each week, but for what? They need to be able to play either at a local competitive level, or re-enter the international field, even on a small scale, to get momentum for the future. But to achieve this they need a benevolent helping hand. A corporate sponsor would be invaluable to their cause, but the big fish might be a wealthy (by comparison) AFL club taking them under their wing as a partner. Inor’s coaching partner is Joao Barras Dejesus. Between them they keep the existing core of players active and learning. Back in April Joao started to gather interested players, all Timor Leste nationals, to commence training with a view to reorganising how the game is played there and making Australian Rules the “favourite game in Timor”. This was made tougher with no Australians there to lead the way. Which just leaves this invitation. 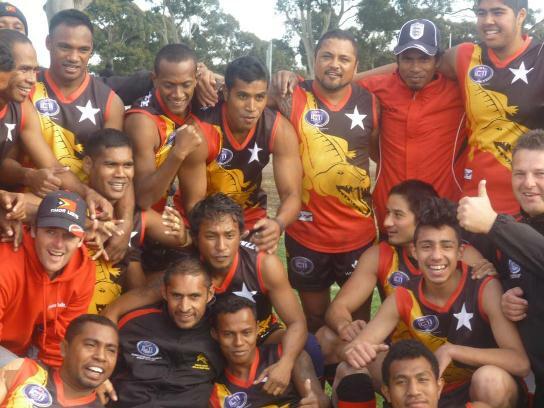 If any reader knows of a business or club which may be interested in helping AFL Timor Leste resurrect their national team and aspirations, get in touch with them directly via email at - president.afltl@hotmail.com or contact us at World Footy News. I'd love to hear that they find a sponsor and an Aussie team or players to go over and help them regularly. But... they shouldn't need that to get the game started again. Aiming to get back to the glory days of having a national team compete overseas may be unrealistic in a struggling nation. Wouldn't it be better if the 20 or so guys splits into 2 teams and trained once a week and played a 9-a-side game once a week? They then have the start of a league. If the guys are enthusiastic and know the basics then there's no reason why they can't organise and maintain that themselves. If it's a success then over time they can spread the word and grow the league to be 4 teams, 6 teams, then go to 12 or 18-a-side if they want, and start to worry about sponsorship for expensive things like international travel. Maybe I've got it wrong but it seems like an example of where going international so early for them might have taken their eye of what is really important - having a local league to play in and have fun and enjoy the sport and grow a community around it... that's what the game is all about for most of the tens of thousands of players in Australia, most of whom never travel or play for their country either.